Zelda has big plans - she wants to be the first chook in space. She leaves nothing to chance and packs food, fuel and a cosy nesting box. But will she make it without the help of her friends? Great fun to read aloud, this wonderfully illustrated story shows that for a plucky chook like Zelda, the sky is never the limit. 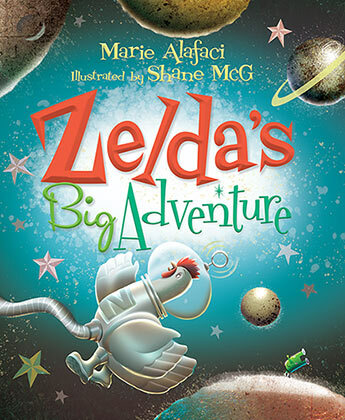 Marie Alafaci has written non-fiction and fiction for children as well as adults, and her biography of her aunt and grandparents coming to Australia in the 1920s from Italy, Savage Cows & Cabbage Leaves - an Italian Life, was on the Age best-sellers list and short-listed for a number of awards. Shane McG is a Melbourne-based illustrator whose work appears in publications globally. He writes and illustrates his own picture books for children as well as illustrating for a wide range of authors.